Zooming Japan suggested Nobunaga Oda (織田 信長 / daimyo and initiator of the unification of Japan, 1534 – 1582), Nokogiriyama (鋸山 / a mountain in Chiba Prefecture), Noh (能 / a type of Japanese theatre), and Noto-hanto (能登半島 / the Noto Peninsula); and Japan Australia also suggested Nobunaga Oda, as well as Noboribetsu Onsen (登別観光協会 / a famous hot spring in Hokkaido), and nori (海苔 / Japanese seaweed). Nokogiriyama, or Mount Nokogiri, holds a special place in my heart although I haven’t actually been there yet. You see, I planned to go there in April 2011, but as there were so many aftershocks from the Tohoku earthquake at that time I decided against going up a mountain by myself and risking scaring myself senseless. I think I made the right decision, as there were a lot of rumbles in Chiba Prefecture while I was there, but I was gutted to leave Japan without having the chance to visit this amazing place. 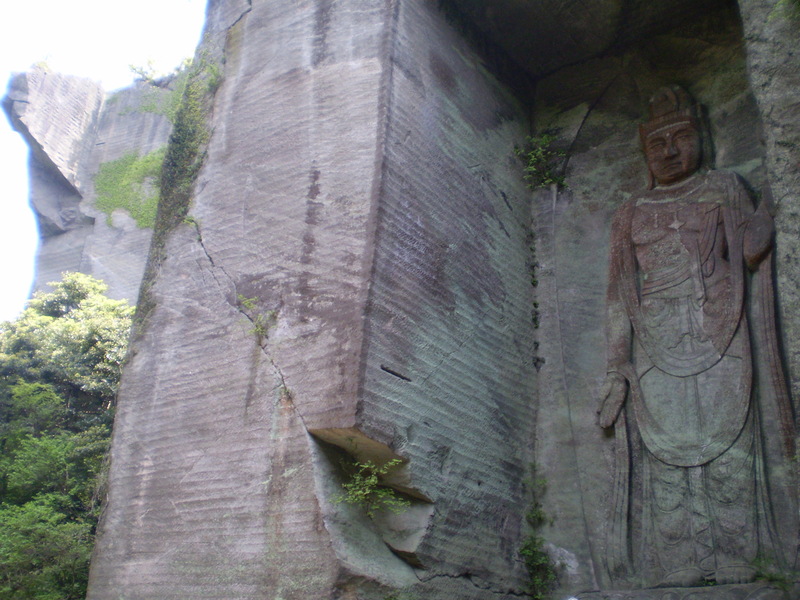 Mount Nokogiri is, as I mentioned, located in Chiba Prefecture, which is not that far away from Tokyo. In fact, Nokogiri could easily be a day trip from the capital. As some of you will know, I love big Buddha statues. I’ve seen quite a lot of the ones in Japan, but there are still a few I haven’t been able to visit yet and this is the one I most want to see. Mount Nokogiri is part of Nihonji, the oldest temple in Kanto, and opened in 725. The Nihonji Daibutsu (above) was originally built in 1783. 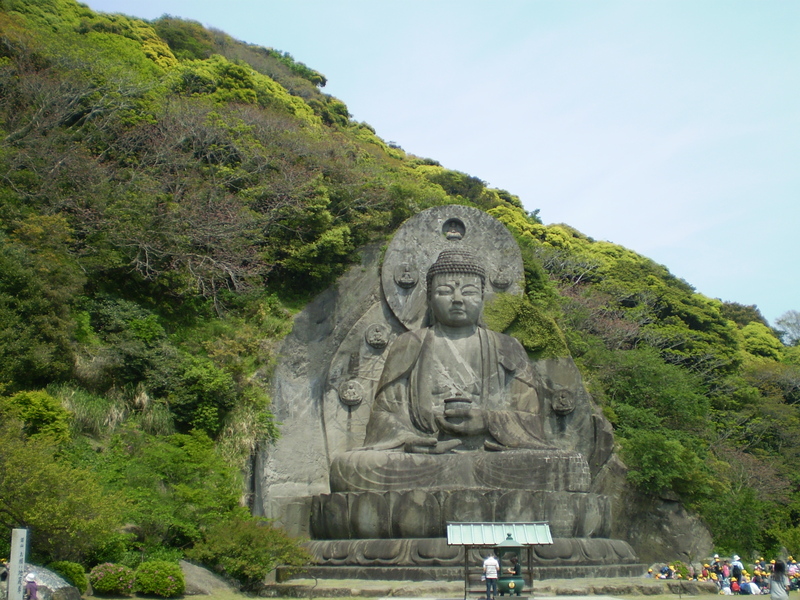 As well as this massive seated carving of Yakushi Nyorai which is 31.05 metres tall and the largest pre-modern, stone-carved Daibutsu in Japan, there is also a 30 metre tall carved relief of Kannon, known as the ‘Hundred-shaku Kannon’. 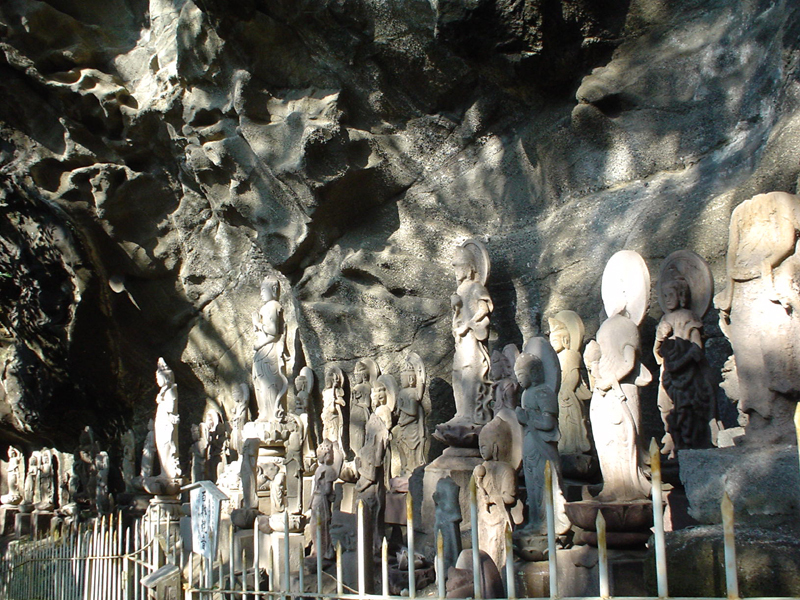 These alone would make Mount Nokogiri worth visiting for me, but there are also thousands of smaller stone Jizo and Rakan statues to be found there, tucked away in caves dotted along the mountain paths. 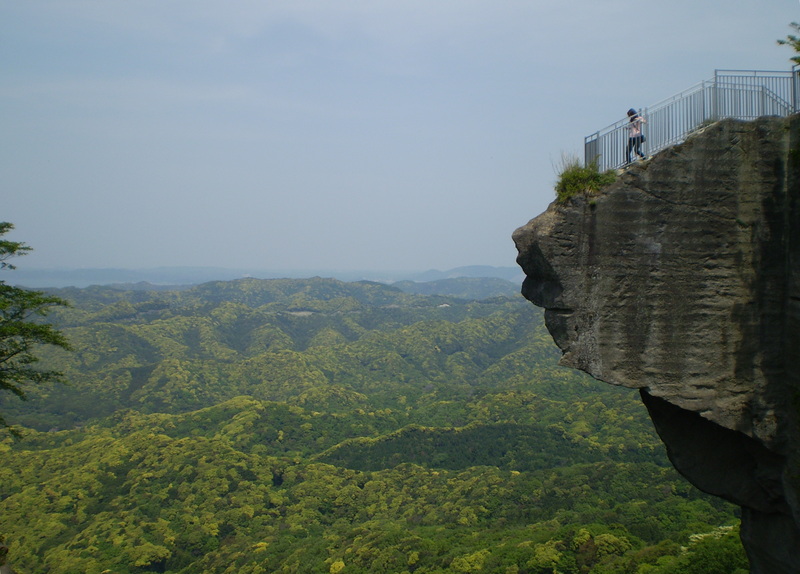 Mount Nokogiri is also a good place to visit for the views. 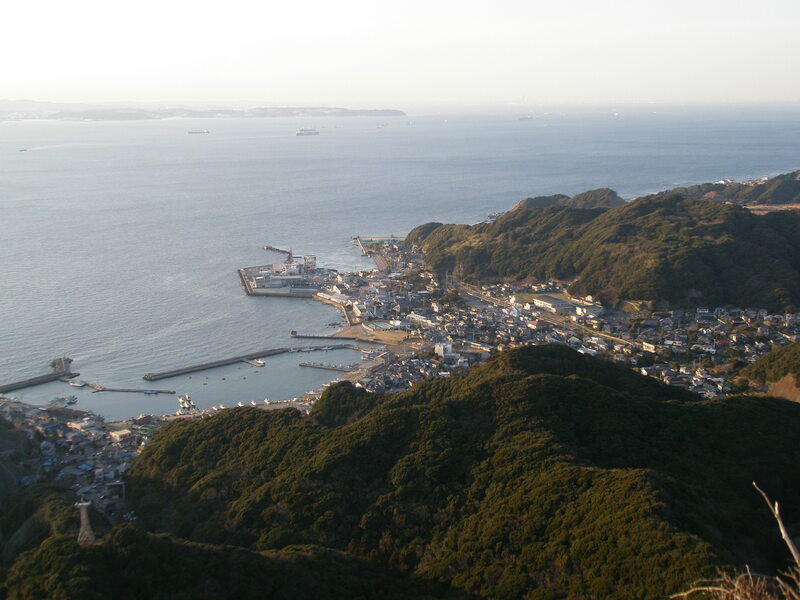 Once you reach the peak, either by climbing the steps or taking the short ropeway journey, you can see a rewarding view right across the Boso Peninsula and Tokyo Bay, even though the mountain is not actually that high (only 329 metres). ‘View of Hell’ (地獄のぞき / Jigoku Nozoki) – looks more like a view of heaven to me! Mount Nokogiri is firmly at the top of my list of ‘places to visit next time I’m in Japan’, and I’m hoping ‘next time’ might be next year, so watch this space! Next week we’ll start with は (ha), so please leave a comment below suggesting a topic for things beginning with は. Topics can be anything, as long as they are connected to Japan – food, places, people, characters, whatever you want to hear about! Just remember that the words you suggest must be Japanese words. I hope you’ll get another chance in the future. I REALLY loved the place! Thank you for writing such a great blog piece about it! I’m sure I will get to visit – it’s definitely on my list for next time (although the list is very long!). Nokogiriyama looks like a beautiful place to visit and would make a great day trip from Tokyo. A few suggestions for next week: Hanabi (fireworks – summer favourite in Japan), Hanami (cherry blossom viewing), Hakata (Fukuoka), and Hakone (famous for hot springs and natural beauty). Nokogiriyama would’ve been my biggest suggestion. It’s also a place I planned to go to, but decided not to. Not because of the earthquake, but because I’d walked 35 km earlier in the week and was too sore and tired to make the trip over to Futtsu and hike up a mountain. Ha. Hakone, of course. Hachimangu (a whole series of shrines). Habu (snake in Okinawa). Harisenbon (both a comedy duo and a porcupinefish). Hashi (chopsticks or bridge). Hamada Masatoshi (half of Downtown). Hasedera (temple in Kamakura). Hamamatsu (a city in Shizuoka, which you should know quite well, I think). Ha is an easy one. But I think I’ll stop here. Hope you get to visit there someday too!